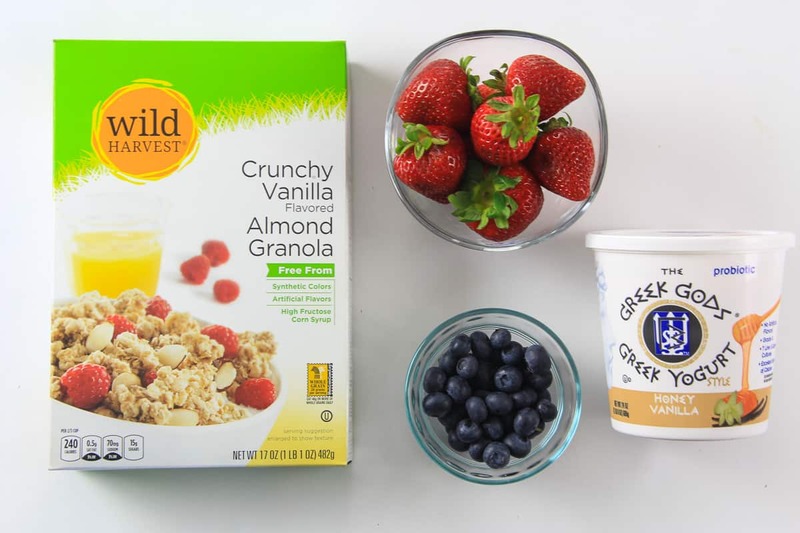 This Greek yogurt parfait is loaded with honey vanilla Greek yogurt, fresh berries, and crunchy almond flavored granola. For a more hearty breakfast try our cottage cheese pancakes with fresh raspberry sauce. We posted this recipe way back on Jul 4, 2015, we’ve tweaked it a bit since then. This post may contain affiliate links. Read my disclosure policy here. You can enjoy this berry parfait any time of day. Whether it for breakfast or as an after dinner dessert. We love enjoying sweet treats with berries so much that we include them in our berry chantilly cake, strawberry bundt cake, and honey raspberry cake. For this yogurt parfait recipe start off by rinsing your berries or fruit and patting them dry. Then begin assembling your greek yogurt parfait by layering the chopped berries, greek yogurt, and choice of granola in order. I like to layer the parfait ingredients in stemless wine glasses because it makes the greek yogurt parfait look extra fancy, but you can place them in mason jars for a more vintage look. Parfait is a semi-frozen French dessert consisting of boiled cream, eggs, and sugar (ice cream) then layered between berries or fruit and sometimes granola. 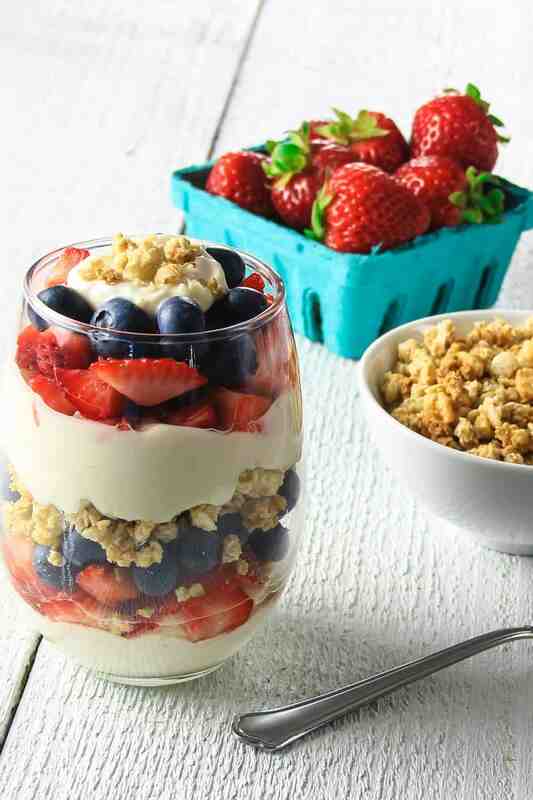 In the United States, parfaits are typically made with greek yogurt, berries, and granola. Parfait is a common dessert item that can be found at most fast food joints like Chick-fil-A or Mcdonalds. Greek yogurt has many health benefits for the body. If you don’t mind it without the sugar, Unsweetened Greek yogurt is packed with protein, calcium, and probiotics which are good bacteria that can help boost your immune system. Besides this yogurt parfait recipe, Greek yogurt can be used in recipes that are both savory and sweet. If you love incorporating Greek yogurt in your food, give these greek yogurt recipes a try. This Greek yogurt berry parfait is loaded with blueberries, strawberries, honey vanilla Greek yogurt, and crunchy granola. Rinse and pat dry the blueberries and strawberries. Cut the strawberries into pieces. 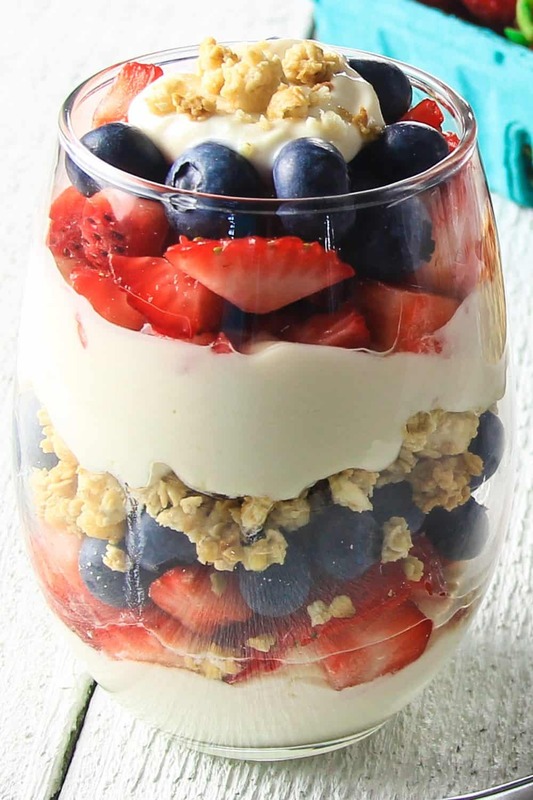 Layer yogurt, strawberries, blueberries, and granola on a tall glass. You can layer as much of each ingredient as you please. It's really a personal preference. This is how I layer it: 1/4 cup Greek yogurt, 1/4 cup strawberries, 1/4 cup blueberries, 1/4 cup granola. I love berry parfaits! This one looks so perfect Dina! Marina, have you tried this yet? It’s been three years, and if you haven’t that means you not only lied to Dina, but lied to us all.